A-Game Cafe – 797 Dundas Street West (west of Bathurst) – Wednesday, April 24th at 7pm. 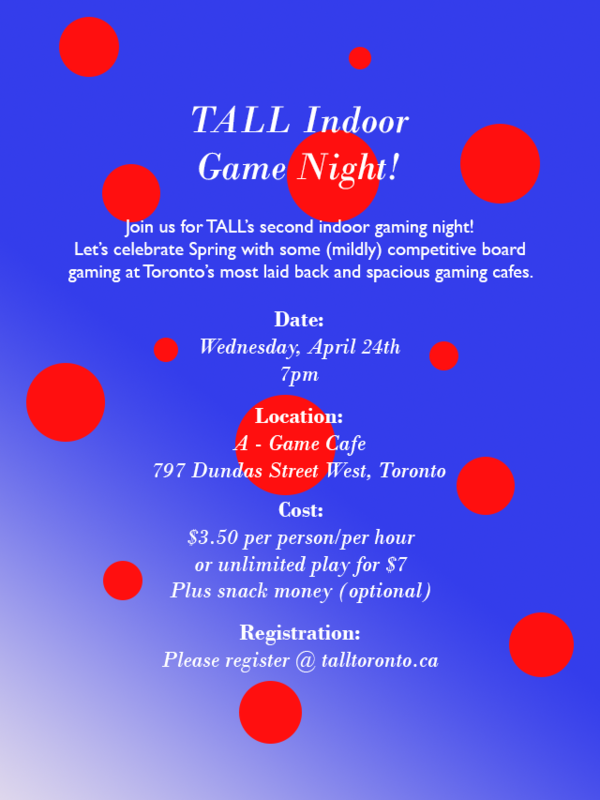 Join us for TALL's second indoor gaming night! This time we are going to celebrate the beginning of Spring by partaking in some (mildly) competitive board gaming at one of Toronto's most laid-back and spacious gaming cafes. We need 10 guests to make our reservation, with space for more at our reserved tables. Best of all, there is only a $3.50/hour per person fee or unlimited play for $7. A-Game has a menu of snacks and drinks to tide you over with fellow TALL colleagues while we investigate whether Colonel Mustard is the guilty party and knock over a few Jenga towers. We will congregate at 7pm in front of A-Game before heading in. A volunteer from the social committee will have a visible sign reading 'TALL'. We will have a 5-minute courtesy wait for latecomers but if you miss congregating, please text or call event planner Jonathan Leroux (647-385-9302). I can also be reached at jonleroux00@gmail.com if you have any other questions before April 24th.